A great deal has been written about the events of 1974........the coup (organised by the military junta in Greece with anti-government factions in Cyprus) and the Turkish invasion of Cyprus. It is not the intention to repeat that information on this website but to focus only on the events that affected the airport. 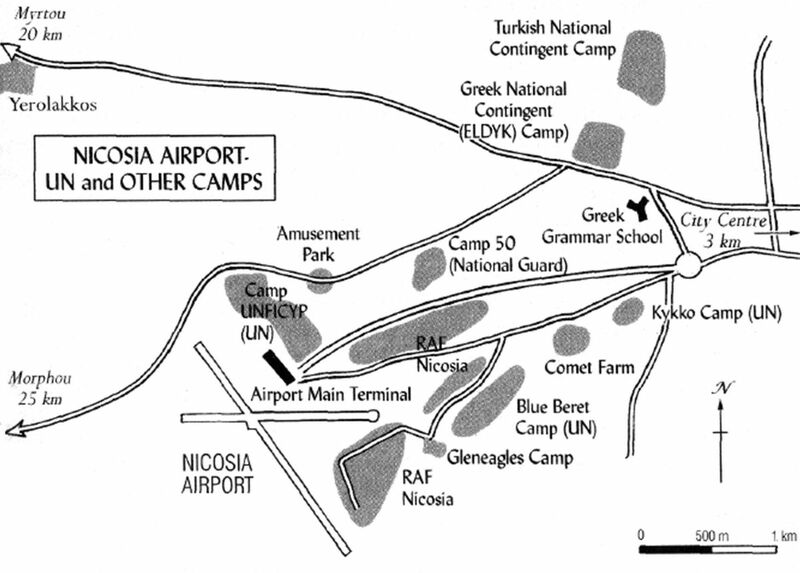 It will aid the understanding of subsequent actions to know the location of the various military camps that existed in the Nicosia Airport area. At 08:00hrs on the morning of 15th July the signal to begin the coup was issued. This followed the classic pattern where key points, such as the airport, were to be captured as soon as possible. Tanks and infantry in armoured personnel carriers left their camps and headed for the nearby airport. At the airport there was a strong pro-government Tactical Reserve Unit (TRU). These forces were officially a police unit but were controlled and expanded by President Makarios. They offered strong resistance for most of the day but their equipment was no match for the coupists who quickly reached the control tower. An agitated and peremptory message was broadcast ......"We are forced to close - No more traffic." 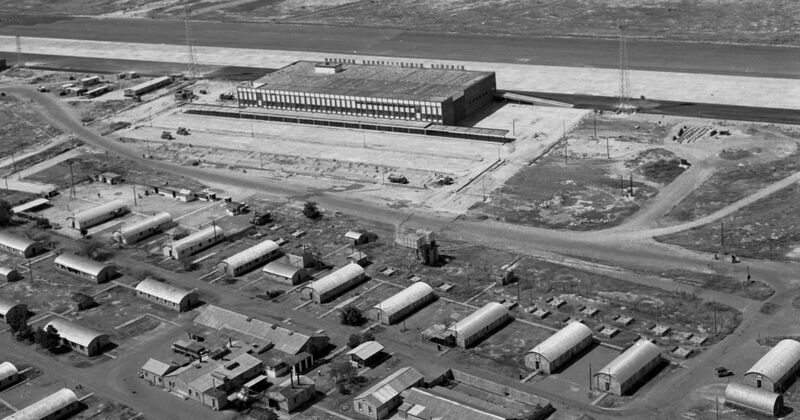 Additionally, troops took control of the Air Traffic Control Centre (which controlled the Nicosia Flight Information Region). Camp UNFICYP's main gate was only 300m metres from the terminal building and when the British Adjutant finally gained access, he found the ground floor covered in spent rounds and broken glass. Upstairs he found a large number of frightened tourists whom he gathered together in a safer part of the terminal as several TRU members were still holding out on the terminal's upper floors. Surviving members of the TRU and ordinary policemen found sanctuary at the nearby Camp UNFICYP or Blue Beret Camp. At 22:00hrs on the day of the coup an Olympic Airways Boeing 707 landed and disembarked a large number of young men in civilian clothes. The aircraft left a mere 20 minutes later. A similar event happened on the 16th July when a Greek airliner brought in a number of men and several very heavy boxes. It departed shortly after carrying wounded Greek soldiers. Late on the 17th July, the National Guard announced that the airport would reopen at 05:00hrs on the 18th July. As well as the stream of charter flights of varying nationalities evacuating tourists, a further two Olympic Airlines planes brought in a large number of 'young males'. On the 18th July, Colin Smith (former Observer correspondent) arrived with other reporters on a charter flight from Tel Aviv, the first civilian passengers to land there since the coup closed the airport on Monday morning. "At the terminal building were some smart, fit looking soldiers in shorts and green berets carrying Thompson sub-machine-guns who turned out to be from a Greek Cypriot National Guard commando unit. Behind them was a mass of anxious looking civilians of all nationalities, holidaymakers, hoping to leave the island on the aircraft that had just brought us." Many tourists were flown out of Cyprus during the next 48hrs but, by the 20th, not all those who wished to leave had been able to do so.